John Randolph Bray was born in Addison, Michigan on August 25, 1879. In the 1880 U.S. Federal Census, he was the second of two children born to Edward and Sarah; his father was a minister. The family lived in Rollin, Michigan. According to World Who's Who in Commerce and Industry (1936), he attended the Detroit School for Boys, and the Detroit School of Art. In Who's Who in New York City and State, Volume 10 (1938), Bray was a student at Alma College in Michigan. …From the first publication of these pictures the circulation of "Judge" went rushing upward by thousands of copies per week and it is still continuing to do so. More remarkable than this, however, is the demand for their publication in book form. The Reilly & Burton Co., of Chicago, recently secured the book rights to this series and their bare announcement to book sellers that they had done so sent the orders for 500,000 copies. This is the most phenomenal record of sales known to the book world and according to all precedent in book publication means at least an ultimate sale of 3,000,000 copies…. Proceeds from the book and other work provided Bray with the means to purchase a farm, which was reported in the Poughkeepsie Daily Eagle (New York) on March 9, 1909. Mr. John Randolph Bray, who has gained fame as the creator of "Johnny and the Teddy Bears," which he draws for "Judge" every week, has bought the J.P. Whitley farm on Vineyard Avenue, Highland; and together with his family and father, the Rev. E.A. Bray, will make his home there in the future. The farm consists of about 80 acres, is delightfully located and abounds in historic and artistic hills, which fact induced Mr. Bray to make the purchase. The purchase price was $10,000. There are three houses, a good barn and other out buildings on the place and also a number of fruit trees. It is reported that Mr. Bray will erect several studios and towers among the hills on the west end of the farm…. According to the 1910 census, Bray was a farmer in Lloyd, New York; the household included his wife, the cook Bertha Abels and her son. An animation pioneer, he produced his first short, The Artist's Dream, in 1913; his filmography can be viewed at the Internet Movie Database. Additional information about Bray Studios is at the Bray Animation Project website. A profile of Bray, in the Corpus Christi Caller and Daily Herald of June 24, 1916, can be read at Chronicling America. He signed his World War I Draft draft card on September 12, 1918. He lived in Manhattan at 611 West 112 Street, apartment 6F. His occupation was "President Bray, Motion Pictures" at "Bray Studios, Inc." His description was medium height, slender build, brown eyes and hair. In 1920, Bray, his wife and maid lived at 611 West 112 Street. The census recorded his occupation as "president" in "motion picture making". At the time of the 1930 census, Bray lived in Norwalk, Connecticut at 94 Winfield Street. He gave his occupation as an artist making paintings. Shortly after the United States entered World War II, Bray signed his draft card on April 27, 1942. He lived at Sasqua Hills, East Norwalk in Connecticut. His employer was Bray Pictures Corp., at 729 7th Avenue in New York City. Bray's wife, Margaret, passed away on January 16, 1968, as reported by the Bridgeport Post (Connecticut) on the same date. A little over ten-and-a-half years later, Bray passed away on October 10, 1978. His death was reported in the Seattle Times on October 12, 1978. Bridgeport, Conn.—(UPI)—John R. Bray, a newspaper cartoonist credited with inventing some of the animated-cartoon processes that gave Mickey Mouse life, has died at his home. Bray, who moved to Bridgeport several years ago, died Tuesday. He was 99. Bray's career as a cartoonist began in 1901 with The Detroit Evening News. 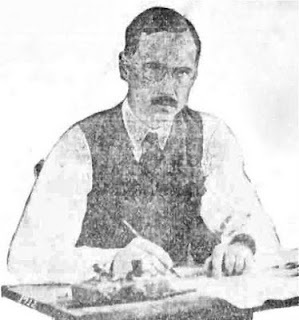 From 1903 to 1904, he served as a cartoonist for the former Brooklyn Daily Eagle. Between 1905 and 1913, he contributed cartoons to Life, Puck and Judge magazines and McClure Newspaper Syndicate. In 1910, he invented a process improving on animation methods invented three years previous, and in 1912 he introduced some of the first animated cartoons in theaters around the nation. Almost all of the early animators, including Walt Disney, used his processes. The book, American Silent Film: Discovering Marginalized Voices, edited by Gregg Bachman and Thomas J. Slater, has an excellent chapter on Bray, his studio and some of the cartoonists who worked for him; it can be viewed here. Thanks Alex. Looking at the picture at the top of the post, all I can think of is, "Gee, would it KILL you to smile for the camera, John?"